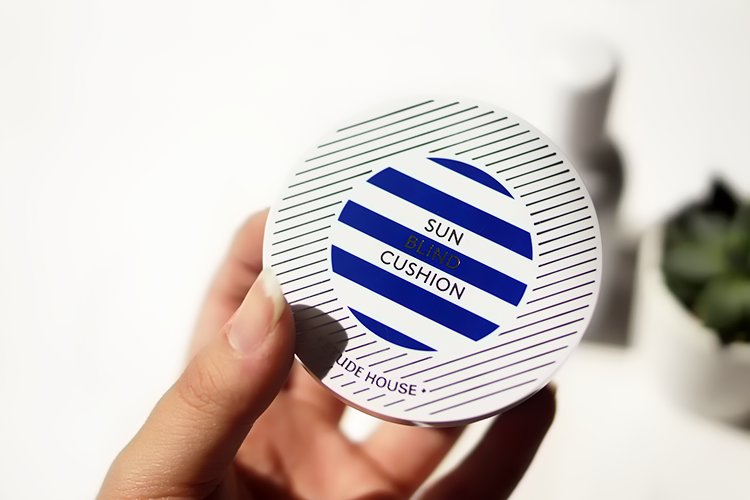 I'm really excited to bring you today's review of the brand new Sun Blind Cushion SPF 50 PA+++ from Etude House. 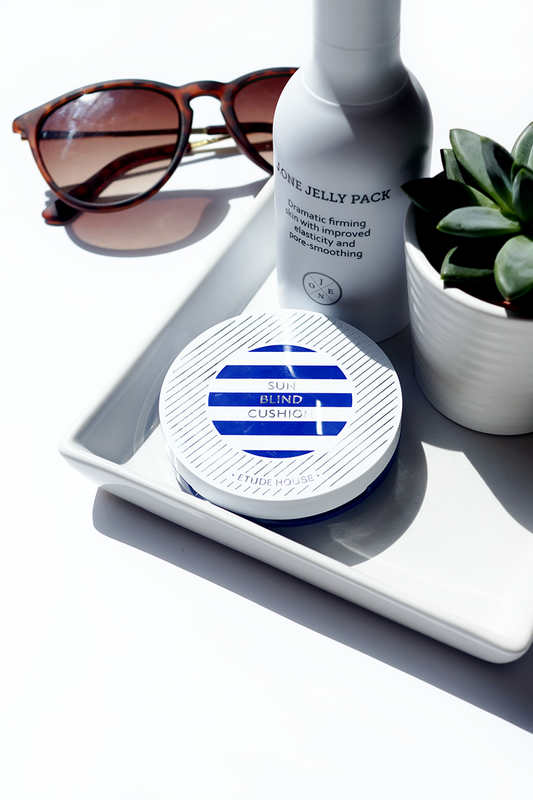 I've really been liking their innovative cushion ideas lately, such as the Real Powder cushion for oilier skins (review + try on here), and the AC cushion for acne control. 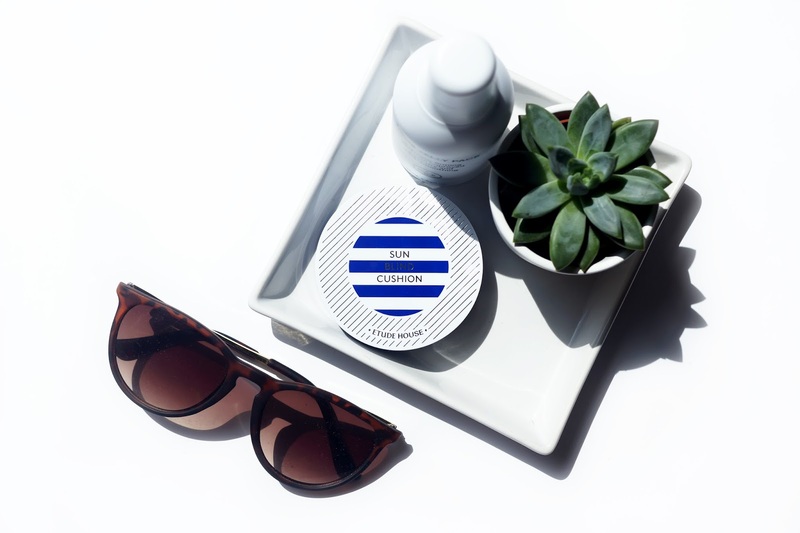 The latest in their string of innovations, the Sun Blind cushion, was formulated to top up your SPF throughout the day - specifically on top of makeup, and without getting it onto your fingers. So let's take a closer look! According to recent research, we're meant to be reapplying our sunscreen every 2-3 hours. Now I'm not the only person that's completely guilty of not doing so! Because in all honesty, a) it's a faff, b) I'm prone to forgetting and most importantly c) sunscreen does not sit well on top of a fully made up face. 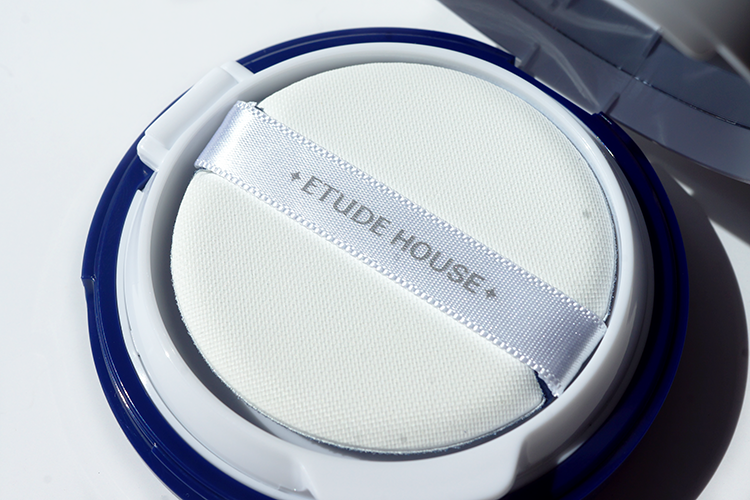 Etude House's Sun Blind Cushion is supposed to be the answer to all these woes. So let's break this down. 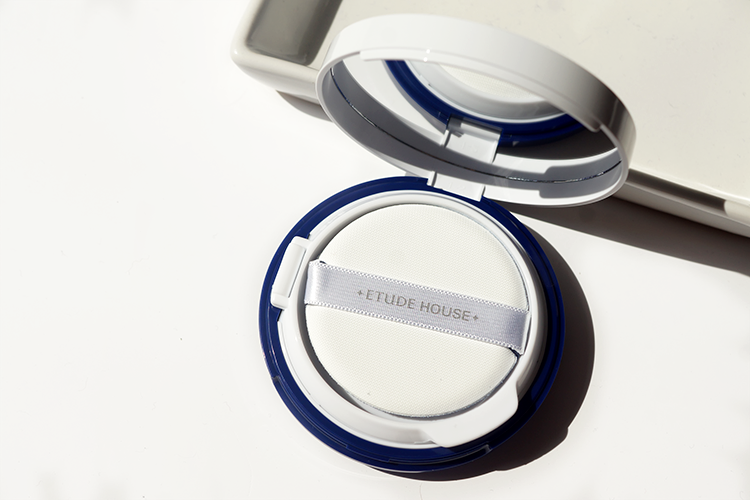 The compact is identical in size and shape to the Real Powder cushion, it's nice and slimline, moreso than most other brands, so is great for throwing into your handbag. You get a fullsize mirror, which I always like to see included in a compact of any kind, and the inner lid snaps shut to keep your cushion fresh. Frankly, I think the packaging design is pretty garish. I think there's a nod to some kind of nautical, maritime theme? And I think all the stripes and lines are representative of venetian blinds, as if to say this cushion is going to be like blinds for your face. I'm sure you're all well aware of my preferred colour palette by now so it'll be no surprise to you that I don't like it. It's priced around £12-15 for 14g, so incredibly affordable, you don't get a separate refill but they're available to purchase. This is a physical or mineral sunscreen, predominantly using zinc oxide and titanium oxide as it's sun protectors, and it contains niacinamide and some botanical extracts, which is certainly a positive. The air puff is blue and white, like many cushion foundations (IOPE etc) and there's a faint scent of baby powder, but really nothing offensive at all. Remove the seal, and bloody hell - it's white. Immediately I'm thinking this is going to be like applying white face paint to my face, and I'll end up looking like Casper. Dipping in the air puff, and the same thoughts are still present. It's brilliant, bright white and looks a little scary. 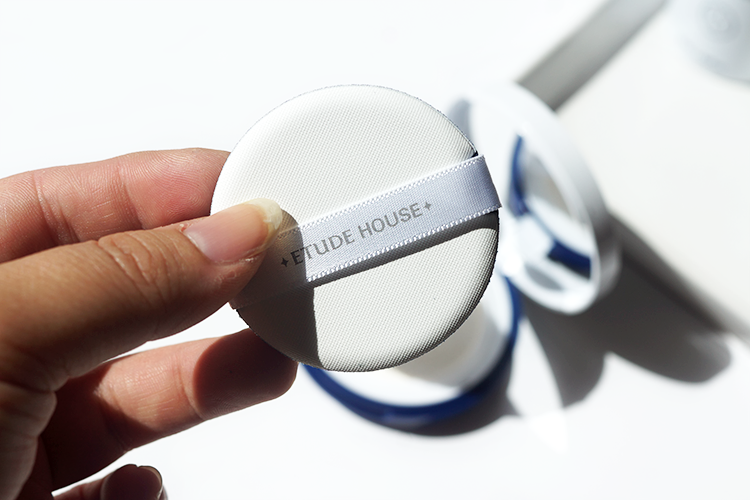 This cushion is designed to be used both under and on top of makeup - so that's exactly what I did. The texture feels fairly thick at first, and for the first few dabs on the face, it's still very white. However, as you diligently pat and blend, it seems to thin out a little and become transparent in colour. There's a noticeable whitening/brightening effect, so this may be a problem for very tanned or deep skin tones. I've found on my skin tone it does die down a little after around half an hour, to the point where it just looks like I'm wearing a luminous base. 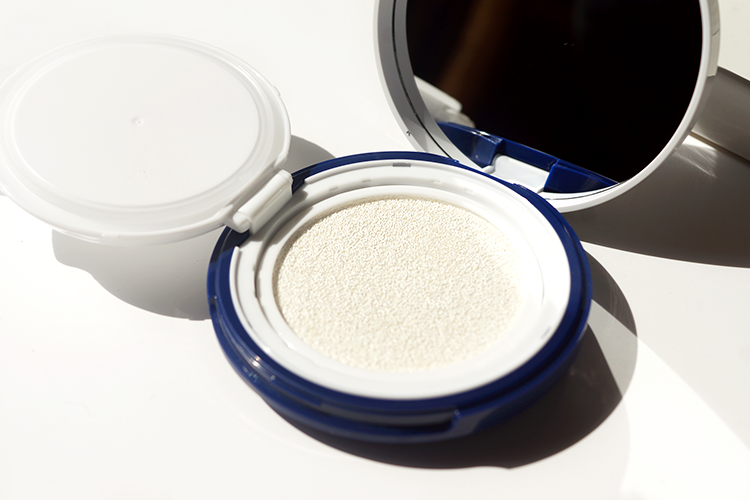 Once fully blended, it actually has a similar finish to the Real Powder cushion - an almost demi-matte, natural-skin finish - thanks to the 'Porous Silica Complex Powder' within the formula, although with no discernable coverage. It doesn't feel sticky on the skin, and makeup applies smoothly and evenly over the top. The real test though, is what it's like on top of makeup. Whilst I thought this would become cakey and sticky, layered on top of makeup, I'll save you all the suspense and announce that it's really good! I haven't used this every 2 hours, because I don't think that's necessary for a day to day, city or surburban lifestyle, especially in a temperate climate. But for an additional 1 or 2 applications throughout the day, there's no cakeyness, no stickiness and no feeling like you're wearing layers and layers of product. I specifically tested it with powder products to see how it layers and the only potential issues are that the whiteness of the cushion can knock back the intensity of blush/highlight/bronzer you're wearing, but not by much by any means. My tips for this product would be to apply sparingly - one press into the cushion goes a long way - and to blot your face before applying over makeup if you have anything other than dry skin. Overall, I think if you're looking for a high SPF sunscreen that you can reapply throughout the day and on top of makeup, this might just be what you're looking for, especially if you, for whatever reason, don't want to use a spray (eg they can be high in alcohols). Essentially, it's just a sunscreen in a cushion, and I think it's the cushion that's what makes it good - the method of application makes sure that makeup underneath doesn't smear around and it's convenient and portable. 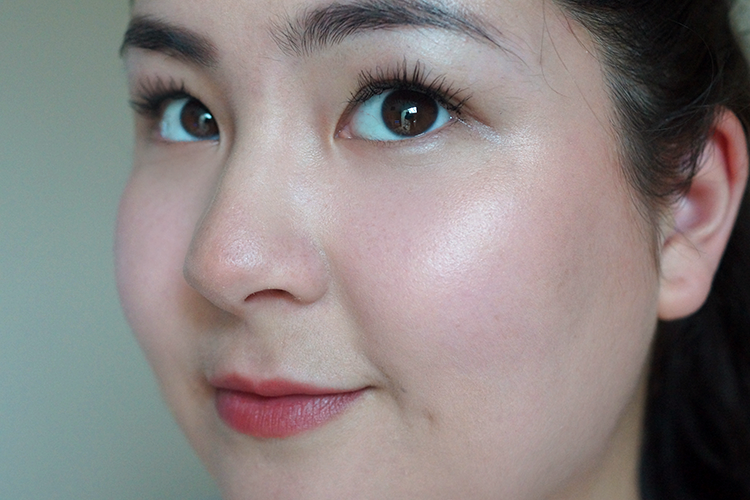 In the after photos, I have 1 application before foundation (Charlotte Tilbury's Magic Foundation in 03 Fair) and 2 applications after and it doesn't feel heavy or sticky, nor do I think it looks it. The whitecast could be a limitation - it personally doesn't bother me as on my skintone (NC 20-25) it's minimal and I'd rather be sure I've got my sun protection down! You might like to try Primera's Sun Cushion if you want something a little more moisturising, or the Bioderma Eau de Soin SPF 30 for an spf spray. The Sun Blind Cushion comes in a single shade and you can pick it up here (or it's available here on eBay should that be your preference!). P.S Have you seen my Korean Skincare & Makeup Haul? this sounds really great! now it's getting a bit hotter i am on the hunt for products like this that can give me sun protection while looking good over a full face of makeup! i have been using the bioderma facial spray with spf 30 recently, it's the same idea as this but it's a water spray and that's been working really well. 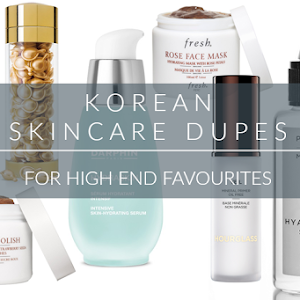 I am really trying to get started with korean beauty brands but don't really know where to start but will look into this brand as ive heard a lot of good things! Anazing spf of this product! Thanks for sharing this, so perfect for summer heat here in Japan! Great blog you have, stay inspired! I have been looking for SPF products for topping up over my makeup throughout the day. So far the one that was mentioned most if from Bioderma, it's a spray bottle. This sounds really good too and I generally like Etude House as a brand so I'll add this into my list too. I wish I had known about this product before I went on my holiday! This sounds amazing :) Thanks for sharing. That looks nice on you! 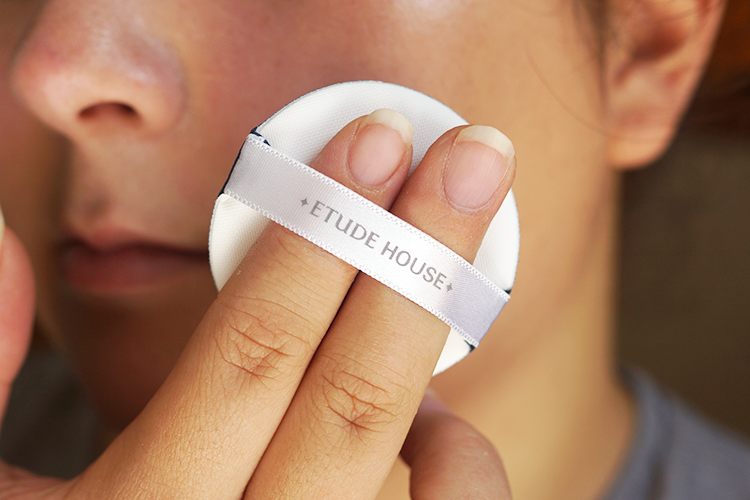 Etude's face product usually breaks me out and hope this doesn't coz I'm dying to try it!